Keep all your beloved jewelries well organized, easy to find, and beautifully displayed with this SONGMICS Jewelry Box. Selected materials and fine workmanship make it sturdy and durable to last for a long time. Color blocking, bowknot decoration and heart-shape lock add elegance to the jewelry holder. Versatile sections are suitable for rings, earrings, necklaces, bracelets, watches and other matching items. Say goodbye to the days of untangling the mixed necklaces or searching for the missing earrings! 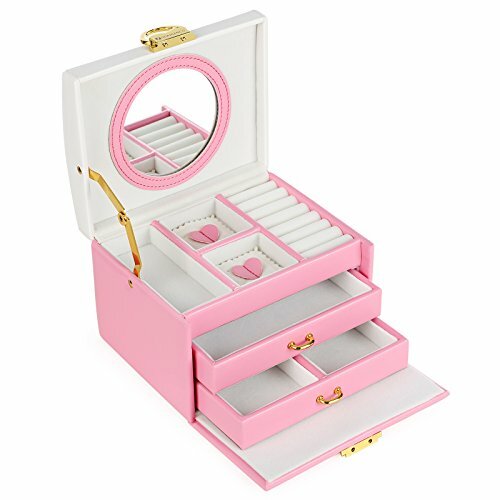 With this jewelry organizer, store all your accessories in one place and find what you need instantly. - Avoid long time sun exposure. - Keep it away from sharp objects like knives.